Learning about the Bible has never been so much fun! Please use a wider screen to play the interactive Wordsearch puzzles! This may be as simple as rotating your device. Print me!! Click on the image to download a free, high resolution printable PDF of the Wordsearch Puzzle. Word searches are an easy way to educate kids! Complete them online or if you are a member you can download and print them for free. It's not hard to see why they are so much fun! Your one-stop website for quizzes, puzzles and games to help you learn about the Bible! Log-in or register for exclusive puzzles and features! Parents, here's a fun and safe way to let your kids try out their detective skills. This entertaining collection of Bible puzzles provides ample opportunities for your kids, ages 8 to 12, to challenge themselves or match wits with a friend as they search for hidden words, find their way through mazes, and solve riddles. Use these puzzles to reinforce Bible lessons, to keep early arrivers and early finishers engaged, and as take-home activities. A reproducible puzzle on each tear-out page. A bright and bold, fun and funky, bumper book of things to do! A mix of colouring, dot-to-dots, mazes, spot the difference, matching, counting, and more. Well organized and readily accessible, The Complete Book of Discipleship pulls together into one convenient, comprehensive volume relevant topics to discipleship. Over 140 Bible quizzes for you to try, interactive and printable. If you are a cruciverbalist or word puzzle enthusiast this is for you! A site with articles that delve deeper into the Bible for a greater understanding. Bible Puzzles and Quizzes for all ages. Play online, download and print to complete at church or Sunday School. 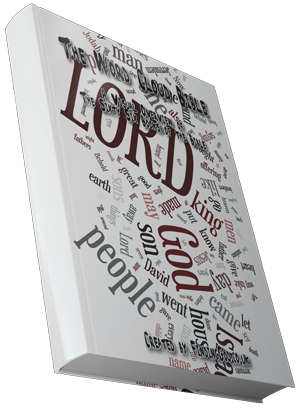 View each Book of the Bible in a cloud of words related to the density of each word. Download your free copy by clicking on the button below.